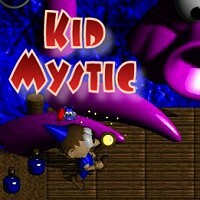 Kid Mystic game download. Free download Kid Mystic for Mac. The evil Bobby Khan has descended on the peaceful kingdom of Tulipton and stolen all the Mystical Orbs, unleashing gobs of gobbling monsters! As Kid Mystic, you must travel across the land collecting all the orbs, that for some reason, Bobby dropped all over the place. Along the way, you'll encounter mind-bending puzzles, enraged mushrooms, creepy monsters, and more! Fight monsters, acquire helpful footwear, collect hidden Spellbooks, and chase down Fairies. Silly and fun dumb humor! Find 16 hidden fairies with unique gifts! Free trial version is not available for Kid Mystic game for Mac.